I've been coming here more and more over the past few months, hoping there'd be even a tiny bit of activity. Hell, I don't even know if this will be read by any members but the question is, now what? Are we really going to let this place, no, this 'Shell' of what used to be Topaz rot? I, personally have had memories made here, Topaz was one of the first sites I joined and looking back on older posts from when I was like, what? Eleven? Just looking back I can see how much I've changed and grown, I'm not the same stupid kid who thought he was the only one who knew what Serebii was, I'm still stupid, but less so. I was the member but still, 13 guests, more likely than not they were bots but still, 13. I didn't want to be the one to suggest it but maybe we should shut Topaz down, officially. I want to see some feedback and hopefully not from just Cyn, he seems to be the only one who checks the site as far as I've noticed. I've said it again and again and again. If you want activity here, all you have to do is do something, say something, show something, and I'll be here. In fact, it's pretty much the only effective way to get any activity around here. I've tried stimulating it myself, but unfortunately I can't hold conversations with myself. I can demonstrably not do anything to generate activity around here. So if you want to see things on Topaz, make something and I promise you you won't be unnoticed or unreplied to. There are still people here, but a lot of us don't have the time to dedicate to making new content for Topaz right now. We're still able to comment abd give feedback, but without anything new. As IB has said, if you can make something, people will come. But to be perfectly honest, making something is the hardest, most time-consuming part. So, the project is still ongoing? Are you guys facing any trouble or dead end? Or the free time to work on the project is the only issue? Time is really our main issue. We have quite a bit done graphics-wise and concept-wise, but putting it together is time consuming. ive been here a while and honestly have done absolutely nothing besides lurk and say im willing to help with anything that needs doing and i think that was back in 2012. Either way, i for one would love to see this project restarted, i just dont know what all has been done and what is available to work with. So my questions are, whats done? what needs doing? and what materials are necessary? Was this being put together on some complicated software that would alot of time to learn and money to buy? or could this be finished by a bunch of people with Unity 3d and a bunch of free time. Let me know. I for one have a massive amount of free time and am very willing to help revive this project. i was in love with it before and still am. Amongst the 3d mmo fan made poke games i still feel like this, which keeps pokemons original style, would stand out as a well-made and enjoyable game, plus id love to see my name in the credit line (hehe). So yea... reply... im eager to begin. Glad to hear it! Although keep in mind that this isn't in 3d or an MMO; we aim to keep in the style of the original 3rd gen games as much as possible. The game is actually being built in RPG Maker XP, using a version of Pokemon Essentials (http://pokemonessentials.wikia.com/w...ssentials_Wiki). We have a lot of the sprites and maps here on the site, but the issue is putting them in RPG Maker and scripting the events - most of which is described in that link above. There are a few more complicated scripts that would need to be done in Ruby programming language, but none of that is (IMO) a priority at the moment. If you want to find a copy of RPG Maker and try out Pokemon Essentials, that would be awesome. Once you get a feel for it, I can start pulling together what we've got, and answer any questions you have. "A bunch of free time" is really the most important part here. Just a note on our use of RPG Maker XP and Pokemon Essentials: the reason we're going this route with the game is that Pokemon Essentials basically has everything we need already laid out. It sets up the battle system, pokemon, moves, items, wild encounters, trainers, etc. I personally am not extremely attached to the layout; if you happen to know of another engine that also has a library containing all of this stuff required for a Pokemon game, I'm all ears. However, it would take a lot longer for us to script an engine with all of that ourselves, which is why we're sticking to one that works right now. im c̶u̶r̶r̶e̶n̶t̶l̶y̶ ̶w̶o̶r̶k̶i̶n̶g̶ ̶o̶n̶ ̶d̶o̶w̶n̶l̶o̶a̶d̶i̶n̶g̶ just finished downloading pokemon essensials and rpg maker xp. ill probably spend the next few days/weeks playing with it. as for trying to gather all thats been finished i havent found much aside from all sprites and most sound files (couldnt find dungeon or pokemon cries). As far as i can see many of the towns still require mapping. and does the main character have a sprite map? ill also say that im a complete beginner but with all the free time i have ill definitely be attempting to learn whats necessary. Also this was probably just me doing the unnecessary but i made a group just to see who was still actively checking this forum and who possibly had the time to continue with help. Last edited by Inferno001; 01-08-15 at 08:19 PM. Sweet; give me a day or so and I can set you up with our current RPGMXP Project. 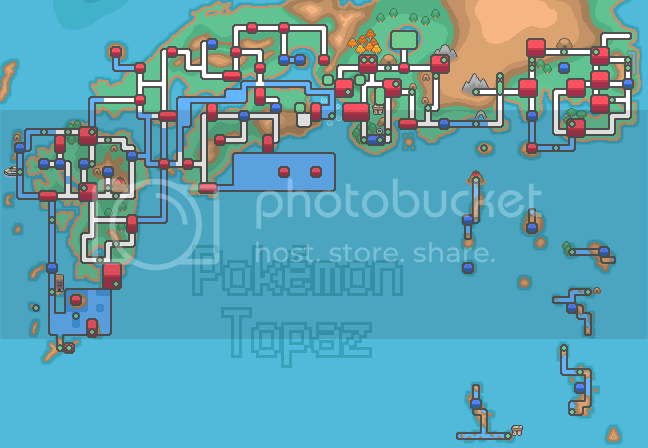 It's rather sparse right now, but I know that it has some maps and pokemon in it already. The female protagonist has its overworld sprites right bow, but I think the male is incomplete. I'm not a particularly talented spriter, but that's something I can take a shot at later in development if someone more experienced doesn't pop in. Your awesome, thanks . Ill go on and mess around a bit, try to get a feel for the program. Hey guys. I'm really glad to see some familiar faces are still around (IB, Cyndadile, it's great to see you). I'm now a sophomore in college studying creative writing with a job that I sort of hate, and I'm attempting to get some of my novels published in the mainstream arena now that I have a few self-published. I miss you guys. I can't guarantee that I'll be able to stick to a schedule for being on, but if you'd like, I can try to help with whatever's left and rejoin the process. Long live Topaz. Nice to see you again, MLEX! And good luck with the publishing! I remember reading something of yours back in the day, and it definitely seemed interesting! A little has changed since you've been gone; We got the start of the TRPG going (I'm still keeping an eye on it, though there haven't been posts lately). Activity has been low lately; I haven't been able to contact IB recently, although SilentSentinel (you may remember him as RagingPrimeape) has been lurking around. Also recently Inferno001 has been taking a crack at the demo, and it seems like he's doing an impressingly good job ironing some stuff out. If you're interested, we've got a page here (http://www.pokemontopaz.net/forums/s...eeded-For-Demo) of some of the things art-wise we need for the demo. Thank you! I'm glad you remember reading it. I'm waiting to hear from a magazine about two of my short stories right now, so when I hear back from them, I'll have to let you know how it goes. I'm glad the TRPG is up and running. I'll probably join in, after I read up on it and figure out how to jump in. I do remember RagingPrimeape, and I'm glad he's still about, too. Welcome Inferno001, and it's great to hear the demo's making progress. I'm in the process of spriting the hero's overworlds (16 of 32 done), and they should be finished before I sleep tonight. I am in the middle of stuff right now. I will be back on the 18th to do things. Nice to see you all again! Sweet! Awesome to see you, and hope you're doing well! As for the database errors, I have no idea what's up with that. I haven't had any issues like that until today; hopefully it's a passing issue? Perhaps IB will know more when he returns. We had an old map for softwind somewhere but I'm not sure if it's the one we are using. I'll try to find it for you. As for moving during cutscenes, I know that if an event is "autorun" then you can't move, but if that won't work we'll have to come up with a more clever solution. I'm not sure if we have it actually mapped in RPG Maker yet; perhaps SS will find one. Last edited by Cyndadile; 01-18-15 at 05:58 PM. That was the map I was looking for, I don't think it's been mapped into XP yet. The 3 towers aren't supposed to be enterable yet, and the building in front of them might not be either. i remember seeing those towers so i think its been partially mapped. as for the map ive been resizing its almost dome but im afraid i did i different one. should i switch? Can you post a picture of the one you've been working on? If it is too different, I'll work on resizing the new one, since it looks like it'll require a bit or resizing. Unfortunately, Topaz has a rather large pair of regions, so (as I'm sure you've noted) resizing may require a bit of fiddling. its the one we have on our regions page on this site. i just split it into layers and resized each piece individually. Hello all. I'm also getting the database error thing. As far as I can tell it's because we're on a fairly old version of vBulletin by now and it needs to update from 4.0.3 to 4.2.2. We might need to contact zeroality. Inferno: It seems like most people were in favor of switching to the new map format, so I'll try to work on making the new one work. I'm having a hard time visualizing what you did with the "layers" though - could you expand on that? IB: Awesome! (Not that you're getting the error, but that you seem to know what the issue is.) I've PM'd you regarding Zero. Also, I've noticed the issue seems to really be affecting the forums more around midnight EST, if that makes any difference. do all of those cities even have names???? Yeah the cities should all have names, stuff that is supposed to be in them, and general themes for mapping. Are there any particular ones you need the names for? But hey, I'm now all of 21 (birthday yesterday), and I've a year off Uni (taking a year out because I missed so much), so I should be able to return to working on Topaz. Yeah that's the full map. Eventually it may be the game map but... 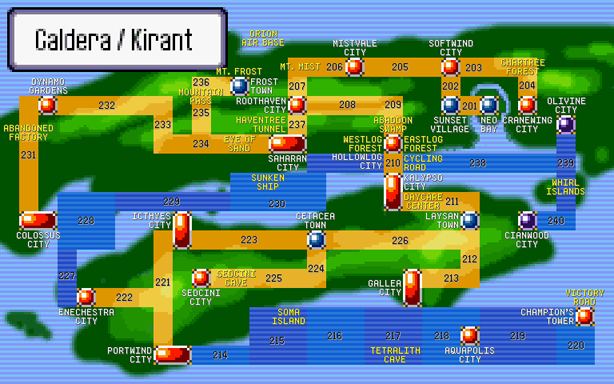 Note Kanto on the right, connecting to Johto. 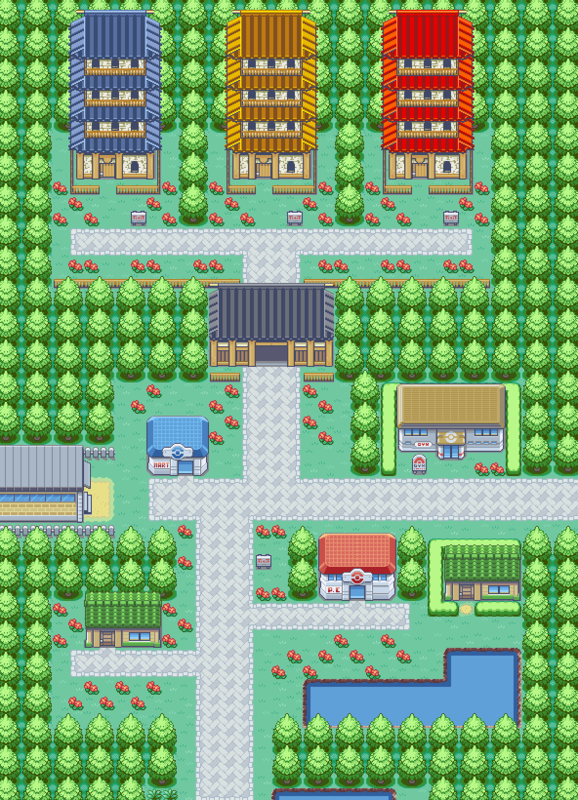 Our regions are left of Johto. Wecome back BTG, and happy birthday! I'm sorry to hear about all that; my grandfather suffered from cancer for quite a while, and I know it's a hard thing to go through. It's a fair bit smaller, but still fairly large. I'm not sure, but we still may end up needing to split it into two regions, which would still be fairly straightforward, since we already have Caldera and Kirant as two different continents. Thanx guys and yes eduardo that is the old one but as far as i know most of the info is still valid so thanx. As for the smaller map that is a huge relief. i can resize that but my issue is setting all the towns and routes in the exact center of a 16x16 pixel grid and then redrawing the pieces of the background that no longer fit... its just alot to do and ik im not artistic enough to do the redrawing. 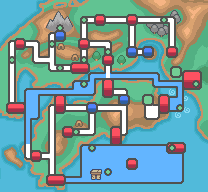 I should be able to get the routes and maps at least if someone else could resize the map, erase all the routes and lines, and then redraw the maps outlines and such i should be set. If someone does take on this task the dimensions are 480x320. Working on it. I have the routes laid out nicely; just need to adjust the landscaping.